I’d been wondering how our isolationist friends in the Alt-Right are reacting to Trump bombing Syria. So, last night, I went looking for responses from all the usual suspects. Many former Donald Trump supporters have turned on the President after his decision to retaliate against the Assad regime for its chemical weapons attack. Nigel Farage, Milo Yiannopoulos Katie Hopkins, right-wing vlogger Paul Joseph Watson, Ukip leader Paul Nuttall and Ukip donor Arron Banks are among the Trump supporters who have been disappointed by their hero. American right-wing commentator Ann Coulter, who campaigned for Donald Trump, wrote: “Those who wanted us meddling in the Middle East voted for other candidates. 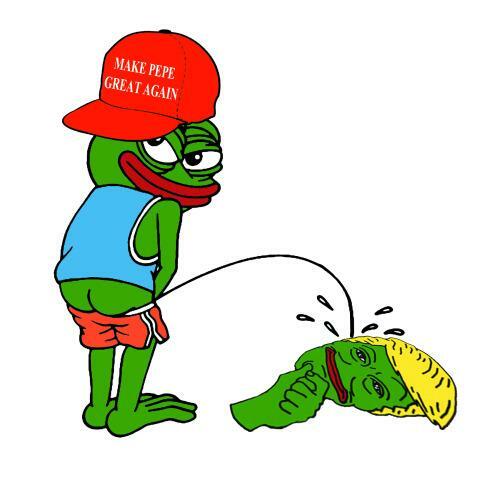 Yesterday, the alt-right and even many seasoned geezers like me took a body blow when Trump abandoned everything he said over the last two years and embraced the idiocy of yet another war in the Middle East. Not only is he embracing the lunacy of the traitorous neocons, he is risking war with Russia. His “reason” for condemning himself to ruin is that his daughter got the sads over seeing pictures of dead kids in Syria. She takes to twitter over this latest agit-prop and in a day daddy is launching missiles at Assad. The United States has no interest in Syria. There are no good guys to back. There’s no “solution” to what ails that part of the world, short of another flood. Syria is a mess because it is full of Syrians. The only sane policy is to make sure it remains full of Syrians. Let them kill each other there, not in Paris or Portland. If the Russians want to build their pipeline there and pay the price for it, good for them. If the Saudis want to stop them, best of luck with it. This is not an American problem. It is their problem. Let them own it. Vox Day himself is also agin’ all that “Neocon” policeman-of-the-world humanitarian-intervention stuff. For the record, I am totally opposed to US involvement in the Middle East. 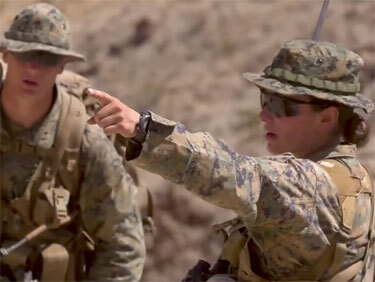 However, as a student of military history, I am also not inclined to leap to criticize strategy on the basis of a single limited tactical strike. War is coming, but not necessarily where everyone assumes it will be or at the behest, and in the interest, of the neocons. Vox is clearly saving his ammunition for RaHoWa [Racial Holy War] or the reconquest of seceded leftist California. 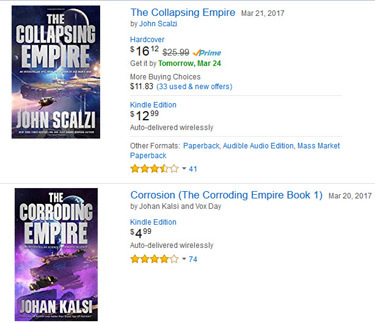 Vox Day yesterday explained that it wasn’t Jeff Bezos or Amazon officially that took down the “Johan Kalsi” parody of John Scalzi’s latest screed. Little SJW nerds buried deep in the Amazon machine are suspected. Since some people seem to want to go on the warpath, let me be perfectly clear here: Amazon is not to blame. I even suspect that it is entirely possible that Tor Books is not to blame either, based on a) when the book was pulled and b) the fact that the book has shown as Live for nearly 24 hours but still does not have a page on any Amazon site. The most likely scenario, in my opinion, is a rogue low-level SJW employee, possibly two, in a specific department. The Corroding Empire was up this morning, but SuperversiveSF found that it has been going up and down. The Corroding Empire isn’t out of the woods yet, because following that conversation, it was blocked again, reinstated again and blocked a third time in short order. Thank you for your support and for holding fire while we sorted out who was, and who was not, responsible for the removal of THE CORRODING EMPIRE. The very helpful KDP representative to whom I spoke said that he did not believe there was anything improper or misleading about the title, the name, or the cover, but we’re going to wait to get explicit permission on all three elements before settling on a final edition that will see print. the Archives of Never Yet Melted in the 'Vox Day' Category.